The 4 Gate Blink/Obs All-In is a build that attempts to abuse the lack of mobility Marines/Marauders possess before Stim Research is finished by using Blink Stalkers to rapidly move between the opponent's main base and natural expansion. This build should mostly be used against opponents that you know are going for a gasless 1 Rax FE strategy as its strength lies in incredibly greedy Twilight Council, Blink and Robotics Facility timings. 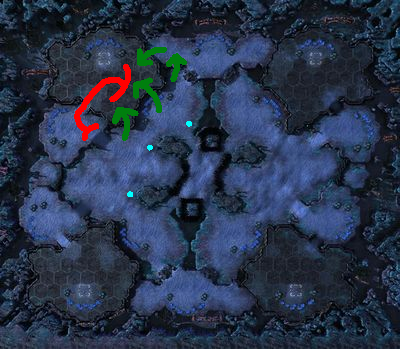 This greediness means that you will only have a single Stalker out on the field for a very prolonged amount of time and this makes you very weak against a Terran opponent who is planning to go for any sort of pressure before your attack commences. However, it should be noted that this build can be quite effective when used against a Factory opening from the Terran, as they usually will not have enough units out to counter Blink Stalker aggression. ↑ Chrono boost Probes three times once complete. ↑ Place this Pylon where ever it is you want to hide your Twilight Council. This can be a proxy location if so desired. ↑ Chrono boost both of these once. ↑ If there is still a scouting SCV in your base, delay this until your Stalker has killed the SCV. ↑ Chrono boost continually until finished. ↑ Start building proxy Pylons once you've queued up the Observer. It can be a good idea to Pylon scout when using this build because it pretty much guarantees that you're going to be able to get into the opponent's base to see their gas timings. If you are confident scouting a 1 Rax FE using a Gateway scout then feel free to do so, as this will enable you to get your first Assimilator slightly earlier and thus slightly speed up all the relevant timings. Cut Probes once you have 16 mining minerals, 6 mining gas, and a single Probe out on the map to lay down proxy Pylons. You do not need more Probes than this in order to support this particular all-in. If your lose the Probe out on the map, build another one to replace it. If the Terran has an SCV in your base before your Stalker is finished, you're going to have to kill it before throwing down your Twilight Council. Placing your Twilight Council at a proxy location is another possibility. 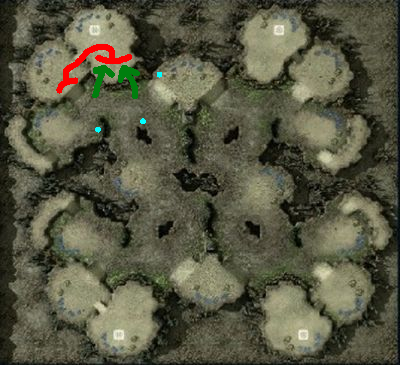 Place your proxy Pylons in locations that enable you to reinforce both near the opponent's natural choke and near the location(s) where you're going to be blinking in-and-out of their main base. This makes it less likely that reinforcements will get cut off by the Terran opponent. In terms of execution, what you want to be doing is making sure that you're dealing damage whilst simultaneously making sure that you're unlikely to take damage to your Stalkers. For example, running right behind the enemy's mineral line in an attempt to kill SCVs is usually a bad idea as your Stalkers will get flanked by units on one side and SCVs on the other. Basically, try to make sure you always have a clear path to a cliff-edge so that you can escape if you need to. Secondly, you shouldn't use Blink micro within the enemy's base, you should instead kite your enemy's units back to the cliff-edge and use Blink micro to get weakened Stalkers out of the base. Once all your Stalkers are down the cliff, immediately attack the natural expansion and target fire any Bunkers that might be there, and when the enemy shows up to defend their natural Blink back into their main base. Another important thing is not to move your Observer(s) too close to the enemy's cliff-edge. They only need to be close enough to give you vision. If they get sniped by the opponent then your attack is going to be significantly weakened until another Observer arrives, and that could give the opponent enough time to set-up adequate defences at both their main and natural. Last of all, there is one important target that you should always be looking for when using this build, and that's the Tech-Lab researching Stim. If you can snipe Stim Research then it's going to be very hard for the Terran to deal with your harassment as you shouldn't really lose many Stalkers to Marines and Marauders without Stim. There are certain maps that are good for this strategy and certain maps that aren't good for this strategy. The maps you're going to want to use this strategy on are the ones that have a large surface area around the main base so that you have multiple locations where you can Blink in-and-out of the opponent's base. Good examples of maps that are like this would be Cloud Kingdom, Antiga Shipyard, Condemned Ridge and Shakuras Plateau. Here are some images that show why these maps are good for this strategy. 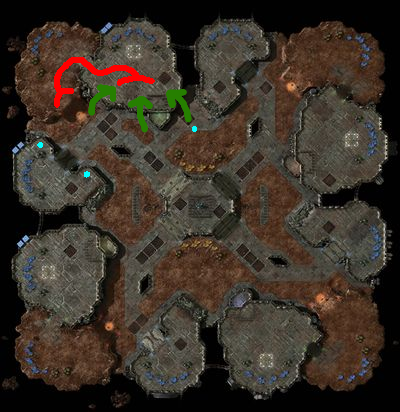 The green arrows indicate possible locations for Blinking into the opponent's base, the red lines show the path the enemy army has to take to defend both their main base and their natural expansion, and the blue dots indicate good places to throw down proxy Pylons. Sting A game from the finals of IEM Season VII (Singapore) where Grubby uses a similar strategy against Sting's Marine/Tank opening. 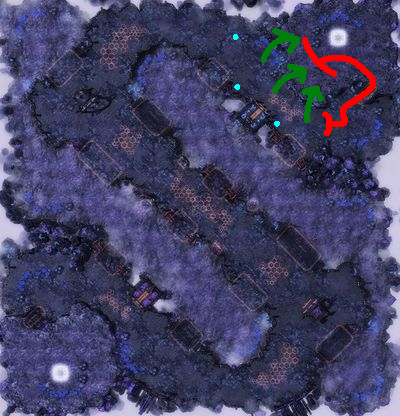 ColonelHuitr A Masters level ladder game showing this strategy vs. a 1 Rax FE from the Terran opponent.